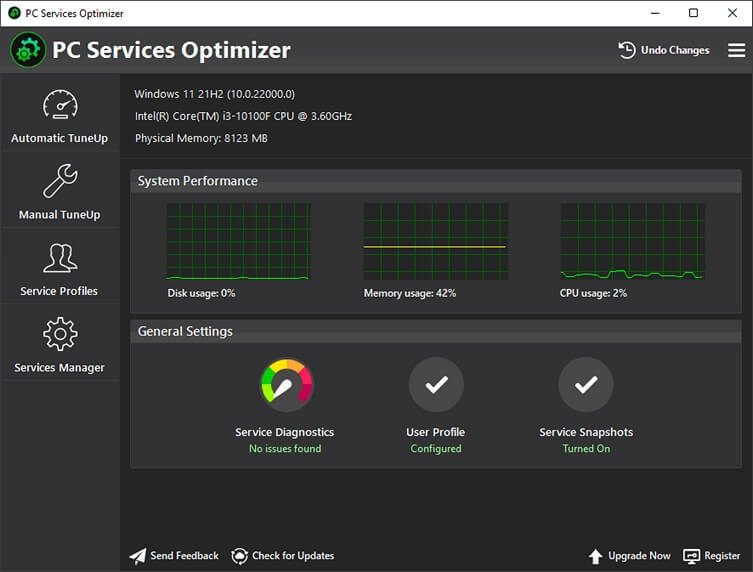 PC Services Optimizer (formerly Vista Services Optimizer) is a powerful Windows services optimization solution that can tweak service settings in an easy and safe way based on the way you use your computer and which hardware and software you use. PC Services Optimizer does not require any technical knowledge, as it provides easy to understand options to tune-up your system. PC Services Optimizer will turn off unnecessary Windows services without affecting system functions, this will make your PC run faster and more secure. Automatic TuneUp feature of PC Services Optimizer is suitable for novices, it can tweak PC settings for best performance in a simple way with no technical knowledge required. Manual TuneUp gives you the power to optimize more Windows services in more advanced way but in the same time it separates you from any technical complexities. Manual TuneUp is targeting experienced users who wish to have more control on the services optimization process. PC Services Optimizer is equipped with Gaming Mode that helps in improving performance while playing games. Gaming Mode will give your system an immediate performance boost by temporary suspending unnecessary Windows features to free up computer resources and concentrate processing power on games you are playing. Improved the reliability of services optimization. Improved the management of service snapshots and profiles. Major user interface enhancements and bug fixes.